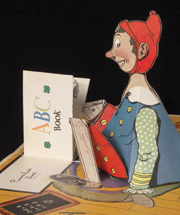 "Birth of a Corporate Pop-up Book" was presented at the Smithsonian Libraries Exhibition Gallery, National Museum of American History, Washington DC, on April 18, 2011. Rube Goldberg Book is Now Here! For many years, followers of my work have asked "When is your Rube Goldberg book coming out?". From the moment I discovered paper engineering I realized that Rube's art would be the perfect choice for a book of movable scenes, with a Goldberg invention drawing on the front, and a large window on the back through which my moving paper mechanisms could also be viewed. This vision has been realized in the form of a movable cover for the new Abrams ComicArts title: "The Art of Rube Goldberg". I'm honored to be a contributor to this collaborative effort from some extraordinarily talented people, starting with Rube's granddaughter Jennifer George. 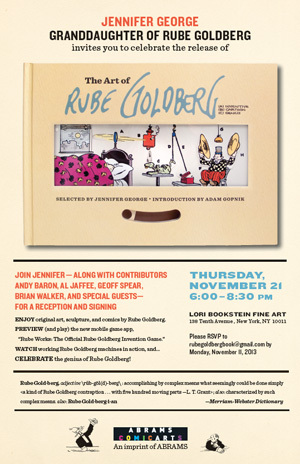 "The Art of Rube Goldberg" is the definitive book on Rube's life and work, from his legendary invention drawings and his Pulitzer Prize-winning political cartoon to his whimsical sculptures, with lots of never before published images. Order your copy today! The event, in the History Museum auditorium, is free with admission; Sundays are free to NM residents. 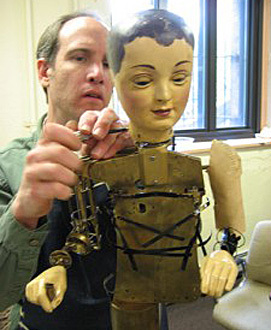 The event begins with a special showing of the Academy Award-winning movie HUGO in the museum auditorium, followed by a slide show that vividly conveys in imagery and video, my connection to the book that inspired the movie, and the automaton restoration that I conducted upon the heels of the book's success.